This award salutes the remarkable contribution made by a professor to HEC Montréal’s international renown, through his or her activities and achievements in the academic, professional and public spheres over the past three years. 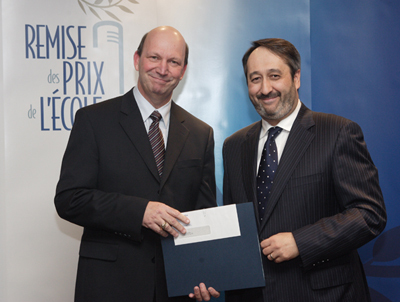 Winner: Jacques Roy, Full Professor, Department of Logistics and Operations Management. Jacques Roy, winner, and Michel Patry, Director.